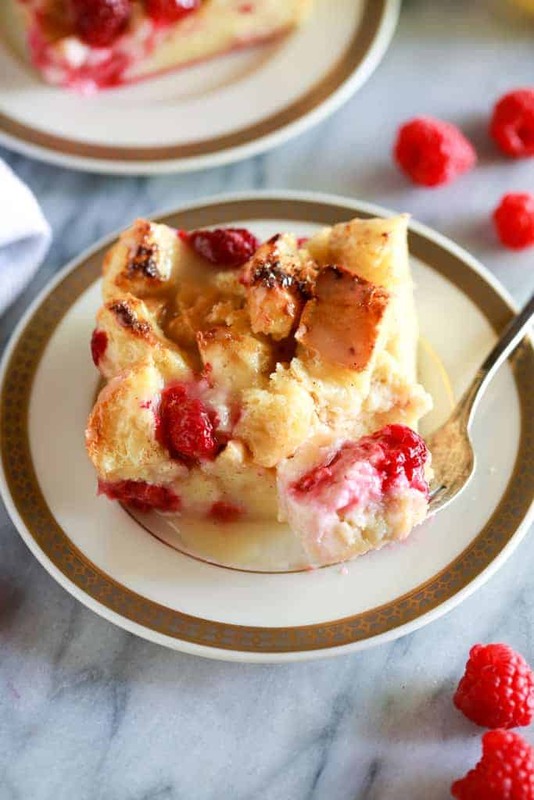 This delicious Bread Pudding is served with berries and a warm vanilla cream sauce. It’s absolutely delicious and the perfect easy dessert for any occasion! Bread pudding, when made properly, is one of the comfort food desserts that’s straight from the God’s! You can serve it any time of year and I love how easy and inexpensive it is to make. I particularly like to make bread pudding when we have guests staying with us, or on special occasions and holidays. 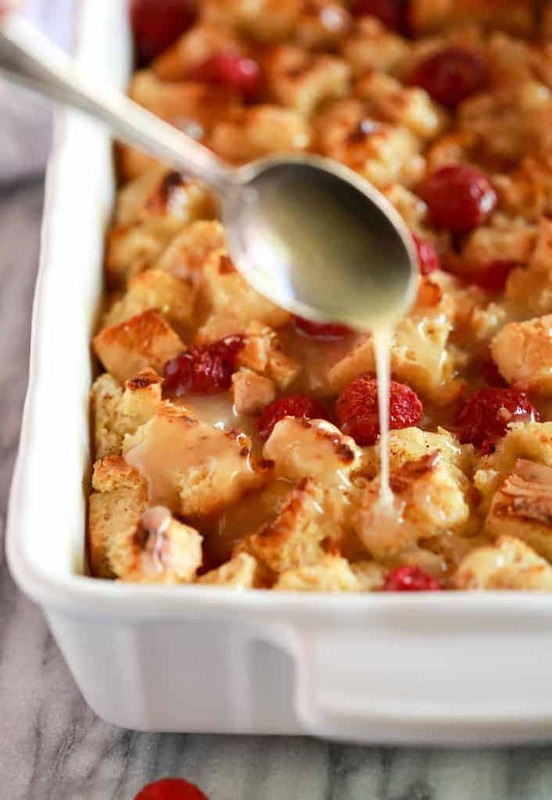 I often add berries (fresh or frozen) to my bread pudding to make it extra special and delicious, and the vanilla cream sauce that goes on top really makes the dessert complete! To make this easy bread pudding recipe, first combine the egg, sugar, cream, and vanilla in a large bowl. Next, cut the aged bread into 1 inch cubes and add them to the cream mixture, tossing to coat. Add half of the mixture to the bottom of your baking dish. Sprinkle a handful of fresh or frozen berries on top. 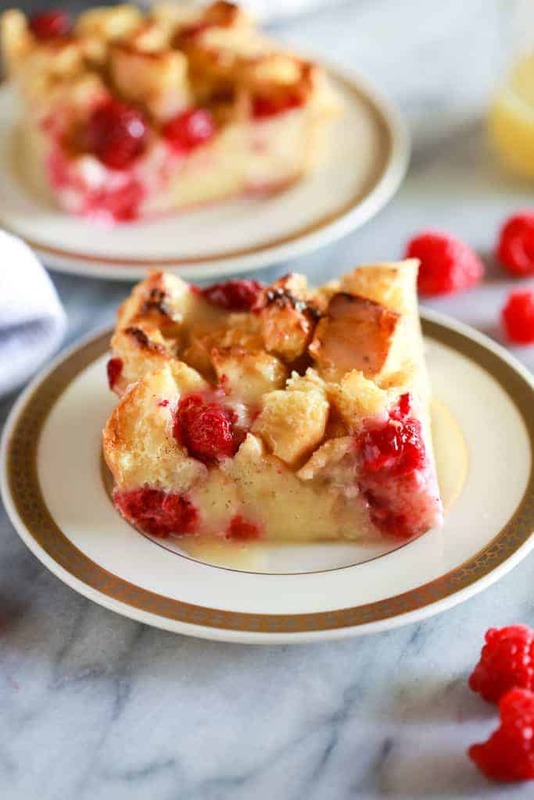 Spoon the rest of the bread pudding into the pan, and sprinkle with a few more berries. Bake your bread pudding in the oven for about 40 minutes or until set around the edges but still a little wobbly and the edges of the bread have lightly browned. The custard within the bread pudding will continue to set up as it cools. For old fashioned bread pudding, you need aged white bread, meaning white bread that’s a few days old and stale. Any white bread will work but I highly recommend using a heavier bread. Some popular breads to use for bread pudding include; brioche, challah, and sourdough bread. If you don’t have time to let your bread dry out and get stale, don’t worry; you can dry it out in the oven. Place the bread cubes on a large baking sheet and bake in a 250 degree oven for about 30 minutes, tossing every 10 minutes, until it’s dry. Using stale bread for bread pudding is the best to achieve the right texture you want. 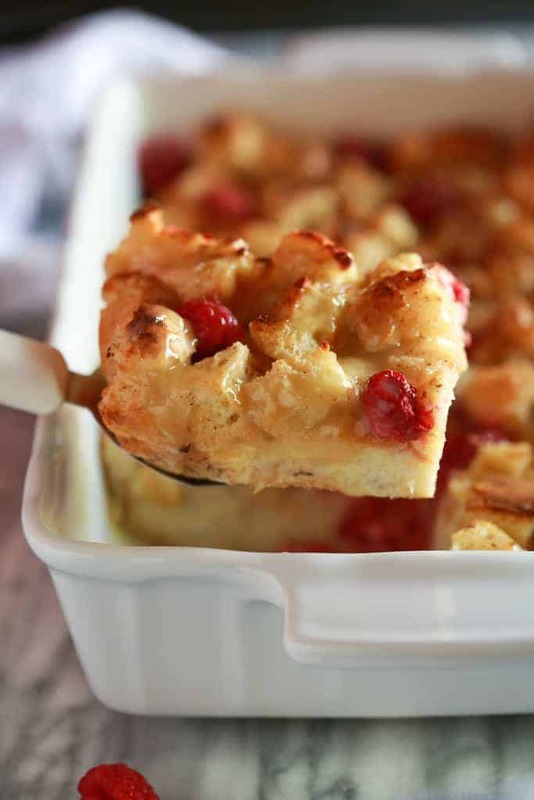 This delicious Bread Pudding is served with berries and a warm vanilla cream sauce. It's absolutely delicious and the perfect easy dessert for any occasion! Heat oven to 350 degrees F. In a large bowl add half and half, butter, vanilla, sugar and salt. Microwave for about 1 minute, just until butter has melted. Add the beaten eggs and cinnamon to the milk mixture and whisk well to combine. Add the bread to the bowl and stir to coat. Pour half of the mixture into a greased baking dish large enough to fit the mixture (any shallow casserole dish; I used a 8x11’’ pan). Sprinkle half of the raspberries over the top. 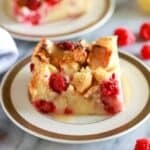 Pour the remaining bread pudding mixture on top and sprinkle with more raspberries. Bake for 30 to 45 minutes, or until custard is set but still a little wobbly and edges of bread have lightly browned. Store leftover bread pudding in the refrigerator for up to 4-5 days. I had this pudding at a local bakery and really wanted to try to recreate it. I found your recipe and gave it a try! It was sooo good – even better than the bakery it I do say so! Thanks for a solid recipe! This sounds great, but where do I find the recipe for the vanilla cream sauce? I don’t see it in the recipe, or even a link. SOOOO Good!! Thanks for a great recipe! The vanilla cream sauce link keeps going to gingerbread. Can you help me with the recipe? Thanks. That’s the correct link. It’s the sauce for the gingerbread cake.